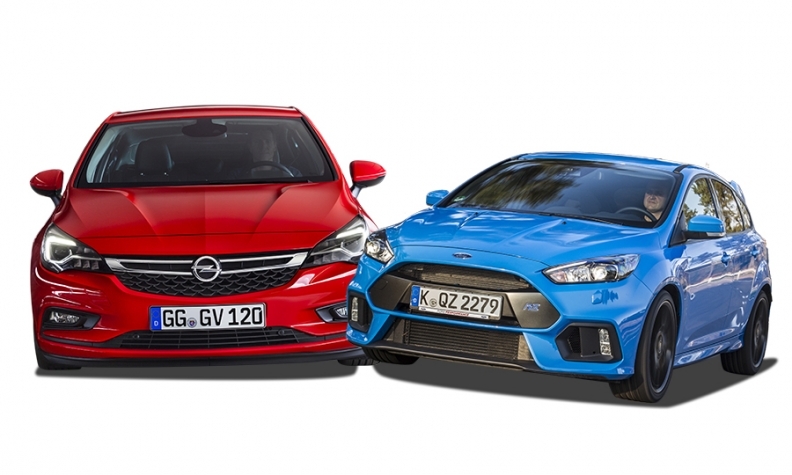 Opel says a key to reaching breakeven will be having a full year of availability of the new Astra (left), while Ford expects to increase sales of performance cars such as the Focus RS (right). Late 2012 was a rough time for the European arms of General Motors and Ford. In September of that year, the U.S. investment bank Morgan Stanley diagnosed GM with a case of financial gangrene and recommended the immediate amputation of chronic money loser Opel. The following month Ford announced the most radical production footprint restructuring by an automaker during Europe’s long recession: it would close assembly plants in Belgium and the UK, as well as shut down a stamping plant in Britain. Fast forward to 2016 and things are very different. Opel is confident this is the year that GM’s European operations will break even after more than a decade of losses. Ford of Europe, which after three years of losses returned to profit in 2015 with the help of an accounting change, expects to once again become the money-making machine it was from 2004 until 2011. The timing of each brand’s rebound in Europe is fortuitous because top executives at GM and Ford likely will need to put more attention into China, where sales have slowed, and South America, where losses are mounting. The comeback of Opel and Ford also puts additional pressure on rivals such as Volkswagen brand, which has been losing market share. Ford of Europe says its share increased marginally to 8.0 percent last year, and that it rose to No. 1 in the unglamorous-but-lucrative commercial vehicles segment. It also is gaining traction in Europe’s fast-growing SUV segment. “Our SUVs were up 31 percent [last year] and in 2016 are expected to grow by about 30 percent to break the 200,000 barrier for the first time,” Ford of Europe President Jim Farley told Automotive News Europe. Opel Group CEO Karl-Thomas Neumann told ANE that SUVs are “one of the shortcomings” at GM’s European unit because its only competitive model in the segment is the Mokka subcompact crossover. “I wish we had three more of those,” Neumann said. “That’s why we announced we will do a large SUV, which will be another very emotional, high-tech flagship for the brand.” It’s all part of Neumann’s plan to boost Opel’s market share in Europe to 8 percent by 2022 from 5.8 percent last year. $16 billion in the previous dozen years and would bleed $1 billion more each year on average into the 2020s. GM’s board saw things differently. It opted to put 4 billion euros into an all-or-nothing gamble that Opel could be turned around by the end of 2016, hiring Neumann, a veteran German auto executive, to execute the plan. Today, Neumann has GM’s European business on the cusp of profitability. Helped by a painful-but-necessary plant closure in Germany, better pricing thanks to an improved brand image and a recovery in Europe’s car market, the automaker expects to break even this year for the first time in recent memory. “We will fight for these last miles and get across the finish line,” Neumann said. Ford also significantly cut costs in Europe while simultaneously investing in new product. As a result of that – and the accounting change that was announced last month – the automaker said it earned $128 million and had an operating margin of 0.6 percent in Europe during the first nine months of 2015. This story is from the February issue of the Automotive News Europe monthly e-magazine, which publishes Monday, Feb. 1. You can download the issues by clicking here. The e-magazine is also available to read on our iPhone and iPad apps. The possibility that overall European car sales will grow for a third straight year comes at a critical time for Opel and Ford of Europe. Given current jitters surrounding China and questions on whether North American sales can keep growing, Europe is becoming an increasingly important market for global carmakers in general. Auto sales have expanded year-on-year in the EU for 28 straight months. Moreover, the region enjoyed its best December in more than 10 years in terms of absolute volume, and its near 17 percent gain matched the high for the same month in 2009. Ford and GM believe current conditions are conducive enough to turn their once-struggling European operations into solid businesses cranking out 5 percent operating margins or even more. For one, Europe is still about 1.8 million units away from a sales high of 16 million reached in 2007, and Russia is about 1.3 million away from a high of 2.9 million reached in 2008. Were both Europe and Russia to return to those levels there would more than 3 million additional sales for automakers to capture. Secondly, both carmakers believe they can dial back margin-eroding incentives if they restore luster to their brands, especially if they concentrate on profitable segments that offer the biggest appeal to consumers. 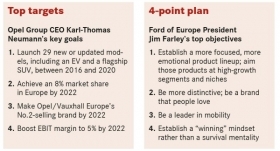 “One of the things we are going to do differently is that we will have a more focused, more emotional lineup,” Farley said, adding that this change is “one pillar that I would stake my reputation on.” He believes the “billion-dollar question” that Ford and all automakers have to answer is: Which segments should we target? “We can’t compete in every segment, every niche in Europe,” Farley said. Product weaknesses also have been addressed. For instance, Opel models such as the previous-generation Astra were criticized for their extra weight, while the brand’s diesels – developed together with truckmaker Isuzu – were considered jarringly loud. Even the car’s instrument panels were badmouthed for featuring a dizzying number of buttons, knobs and switches. Not only have all three issues been fixed in the new Astra that launched in October, Neumann’s team has added features generally found only in the premium end of the segment. Now the compact can be equipped with matrix LED headlights, high-tech wellness seats that massage the driver’s back and its versatile OnStar service, which, among others, acts as a kind of guardian angel in the case of an accident or stolen vehicle. Simply ending the tide of losses is not the goal. Both automakers want more, and hope to be at the forefront of the trends shaping the industry. Opel for example has already created a peer-to-peer car-sharing business called CarUnity complete with smartphone app. Ford is also eyeing an entry into the mobility services business, which it estimates as a $5.4 trillion global market.